OK, so the bar is pretty low. But this moving Dominican-American odyssey (from the makers of "Half Nelson") casts new light on the national pastime. "Sugar" is the long-awaited new film from the writing-directing team of Anna Boden and Ryan Fleck, best known for the 2006 indie hit "Half Nelson," with its memorable performance by Ryan Gosling as a well-intentioned New York schoolteacher with an itsy-bitsy crack cocaine problem. While "Sugar" has none of the overtly Marxian or Brechtian elements found in "Half Nelson," you'd be right in suspecting that it avoids both the sentimentality and the zaniness that pretty much define the unfortunate baseball-movie genre. There's clearly a social and political subtext and context to "Sugar," especially as it captures the strange world of the Dominican Republic's "baseball academies," where that nation's raw talent is nurtured for North American harvest in a sort of plantation system controlled by Major League Baseball teams. But if this is a story about how a beloved American game has become a peculiar quasi-colonial enterprise, it's also a story of one young man's maturation and transformation. Miguel "Sugar" Santos (played by the charismatic Algenis Pérez Soto, plucked by Boden and Fleck from the more than 500 Dominican kids they auditioned) is a teenage pitcher being groomed for stardom. During the course of the story he moves from the Dominican to spring training in Arizona, minor-league stardom in an utterly alien realm of Iowa and onward toward an ambiguous destiny. At first, Sugar is just one of the guys at the Knights' academy in Boca Chica, where young prospects live in dorm barracks under a 10 p.m. curfew, spending every waking moment playing baseball, working out or consuming enormous quantities of cafeteria food. (Oh, there's also English class: "I got it!" "Ground ball!" "Line drive!" "Home run!" And then a chorus of "Take Me Out to the Ballgame.") But when a visiting American instructor shows him the knuckle curve -- one of the most dazzling and difficult pitches in a hurler's arsenal -- Miguel begins to look like a hot property. When Miguel is assigned to the Knights' class-A franchise in Bridgetown, Iowa, he lives on a farm outside of town with an older couple whose principal passions in life are the Presbyterian Church and the Bridgetown Swing, Sugar's new team. He pines for the Higginses' wholesome Christian-teen granddaughter, who likes him back just fine, but the distance between them is more than a matter of race or language or religion. There are moments when "Sugar" feels almost like a spiritual story, a story about a man uprooted from home and family who must face crippling solitude as a test of character. Boden and Fleck's most evocative scenes are wordless, or nearly so: Miguel staring out the window into the Higgins family farmyard, or sitting alone, nursing a beer or a soda, on the fringe of a group of teammates amid the noise and flashing lights of an amusement-park arcade. Pérez has to carry an immense amount of this movie on his muscular shoulders, and must convey to us with very few words and almost no overt emotional display that Miguel is searching for something that baseball can't give him. 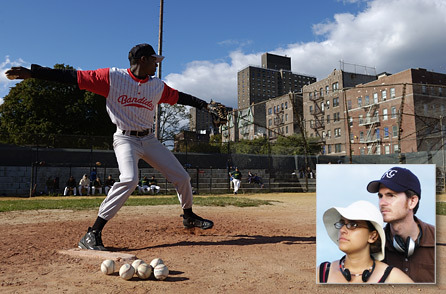 For a few weeks Miguel is the star of Bridgetown's starting rotation, but after he injures his foot and has trouble reestablishing control of his pitches, his archetypal Dominican dream of pitching in Yankee Stadium and lifting his entire extended family out of poverty begins tangibly to slip away. Miguel's story takes some unexpected shifts in the last third of the film, but "Sugar" never tries to psychoanalyze its protagonist, and never inserts a helpful voice-over or an English-speaking mentor or girlfriend to explain everything to us. Miguel's journey, and his ultimate destination, just have a lovely coherence. If the hero of this tender and lovingly constructed film is a dignified young man who holds himself at a distance from us, we'll respect him all the more for it in the morning. It's obvious why Sony Pictures Classics has waited until this spring to release "Sugar," which actually premiered at Sundance way back in January 2008. At the time, I sat down with Fleck and Boden in Park City, Utah, for a brief conversation about the A's chances (abysmal last year; microscopically better this year) and their journey with Sugar Santos from the Dominican to Arizona, rural Iowa and to a surprising conclusion in New York. You're probably getting this a lot, but I've had several e-mails from readers who've been, like, "Those guys from 'Half Nelson' made a baseball movie? Really?" And I would have to say, yes, it really is a baseball movie. Ryan Fleck: Yeah, it's both. It's a baseball movie, sure, because there's a lot of baseball in it. But we studied all the baseball films in preparation for this, and there are not a lot of good ones. It's a pretty tough category, yeah. R.F. : It's hard to sell the reality of what goes on in a game, and if it's OK to pat ourselves on the back, I feel like we did a pretty good job. We were really committed to making the baseball scenes look real and feel real, while also focusing on the human side of the game. It sounds as if you had an amazing experience in the Dominican. You auditioned, what was it? Several hundred young guys before you found Algenis, who is so amazing? R.F. : Yeah, it was over 500 guys, close to 600. The two of us went down there and spent a few months in the Dominican Republic. We'd just roll up on a baseball field -- and they're everywhere -- and set up a tripod and interview kids. If any of them showed any kind of spark, some kind of charisma or something, then we'd give them sides, scenes from the movie, and invite them back the next day. It was funny, it was really telling. They would come in the next day and read everything on the page: the description and then the character name and then the line. Because of course they'd never seen a script before, and we'd have to explain: No, that's the name of your character. Just read the part under that. That was an eye-opening experience for us. Now, based on "Half Nelson," some people may be expecting a strong social and political text to this film, like a critique or an exposé. Without giving too much away, to what degree is this that kind of film? Anna Boden: I think the social context of any story is really important to Ryan and me. We all live in the world, and it's important to make movies that show people interacting with the world. There isn't a lot of really overt political discussion or dialogue in the film, but I do think the foundation of the movie is about the social context of this young man learning that he's part of this system. Even though the kind of political awakening that he has is not something the movie articulates in words for you, I think that emotionally it's an important moment for him. Part of the story of the movie is about him trying to take control of a life in which he's been part of this machinery. Well, even most baseball fans have never seen the Dominican system in operation, and as you depict it, it's this weird and startling pseudo-colonial thing, where the conditions inside the training facilities are completely different from the poverty that surrounds them. Doesn't every big-league team, or almost every team, have a facility down there? A.B. : Every single one. Some of them are very advanced and have 70 players training, and some of them are just starting and share a field with another team and may have six players. But they're all growing, and everybody has a presence down there. R.F. : One of the things that drew us to this story was this really staggering statistic. If you look at the '80s, the percentage of African-American players in baseball was around 22 percent. That has gone down to somewhere around 8 or 9 percent now, while the Dominican population in baseball has risen dramatically. Major League Baseball has taken money out of the inner cities, partly because baseball is an expensive sport to play. It's not like basketball, where all you need is a ball and a hoop. You need lots of equipment, and you've got fields you have to take care of. They've taken money out of the cities and flipped it into the Dominican Republic, where they can sign players much cheaper. Again, we don't want to give too much away, but let's just say that Miguel visits New York, late in the film, and finds himself in the middle of the city's enormous Dominican immigrant community. That's another world most of us haven't seen, even if we live there, as you guys do. A.B. : New York City has the second-highest Dominican-born population of any city in the world. Outside of Santo Domingo, even the second largest city in the Dominican Republic does not have as many Dominicans as New York. It's a huge part of New York culture, and we got to learn about communities in Washington Heights [in upper Manhattan] and the Bronx, as well as communities in the Dominican Republic. One of the most fun things about making a movie, for us, is getting to learn and explore new cultures and new people. Well, you also shot part of this movie in rural Iowa -- that probably counted as a new culture, for you guys! R.F. : That counts, totally! Our whole crew went on Miguel's journey. We were fish out of water in the Dominican Republic, working in a place with a very different culture, where we didn't speak the language. And then, even though they speak English in Iowa -- and everyone is so friendly -- it's a very, very different place to work than New York City. The whole experience was really eye-opening for us. "Sugar" opens April 3 in New York and Los Angeles, with wider national release to follow.